The 2019 Laguna Season opener, was a..
Classic and will go down, on the whole as one of the best weekends of racing in a long time. 56 cars entered and were seeded into two groups an “A main” and “B main”. This had the effect of both doubling the number of trophies and bottles of champagne that were give out but also produced two beautiful races where no one got lapped and everyone had a dance partner. Huge thanks to Martin and Ed Lauber for their party at the Revival Road Company , a jewel box of a facility where both incredible cars get built and great parties take place too. We also want to give huge thanks to Alvin Lumanlan, who took some of the most compelling photos we have seen in a very long, time. And thanks to Jay Ivey, who paced the paddock fixing and tuning all weekend long.. and of course to Cris Vandagriff and the HMSA team who put on a lovely event. Joining the event was great group of cars and drivers from the RMVR, all of them on a grand tour of Laguna, Willow Springs, Sonoma, Thunderhill and then races up in the northwest. The Letterly boys, Matt Ammer, Becky Creighton, Bob Hancock and Pete Christensen are on an epic tour of all the big events on the west, and were a great addition to the group. Group 3 qualifying resulted in a very rapid Austin Newman and Dan Wise, being promoted to the A main, along with Bob Lesnett whose confidence is increasing with every lap. Crafty management of traffic resulted in Tom LaCosta and Jonathan Kitchen on the front row of a very tight pack with Adom Moutafian, Jeff Rothman, Norm Cowdrey, Greg Vroman, Chris Schoap, Joe Bunton, Brian Andrews and a returning Carl Moore all separate by less than a second. Group 2 qualifying saw Art Hebert on the historic and overall pole, .2 sec head of John Hill, followed by Andrew Wait, Martin Lauber, Chris Porritt, Dave Zurlinden, Todd Strong, Danny Baker, Ed Lauber, Laurent Parmantier all separated by less than a second. Another qualifying stand out was Nic Hunziker who pushed his Lotus 51 beyond its design limits up to a very strong P11, followed very closely by Ed Van Tassel and Thomas Parmantier. The Group 3 race was huge fun to watch, with the exception of a two DNF’s the entire group finished on the lead lap. This is a first in the history of the series and it produce tight, flowing racing and passing the entire time. The order was mixed up immediately with Carl Moore and Adom Moutafian surging into the lead within 2 laps and Greg Vroman, Jim Cody, Chris Schoap, Brian Andrews, Tom Minnich and Pete Christensen using an organized draft to go way up the order . George Jewett likewise worked with Pete Christensen and Alan Dezzani to surge up to Rob Thull, chased hard by Mike McDermott, Andy Warburton and Jack Wilson both new to Laguna, but rapidly getting more comfortable. The dice up front between Carl Moore and Adom ultimately opened the door for a patient Norm Cowdrey to sweep past into the lead overall and P1 in Club Ford, followed by Jeff Rothman P2 in Club Ford. P1 in Historic Ford was captured by smooth consistent Tom La Costa, followed by hard charger Joe Bunton, then Carl Moore P3 in historic Ford. Stand out performances by the quiet men, Greg Vroman and Chris Schoap, and another hard charger, Jay Streets who intelligently managed the draft and the turn 2 braking zone and pushed up 7 places. The Group 2 Race got off to an interesting start with Andrew Wait running into the back of Dave Zurlinden.. both half spun and continued. For the most part the rest of the field flowed around them with the exception Geir Ramleth who pitted with a bent front A arm. Martin Lauber managed traffic superbly and earned an impressive P1 overall and in Historic Ford, .7 seconds ahead of John Hill. 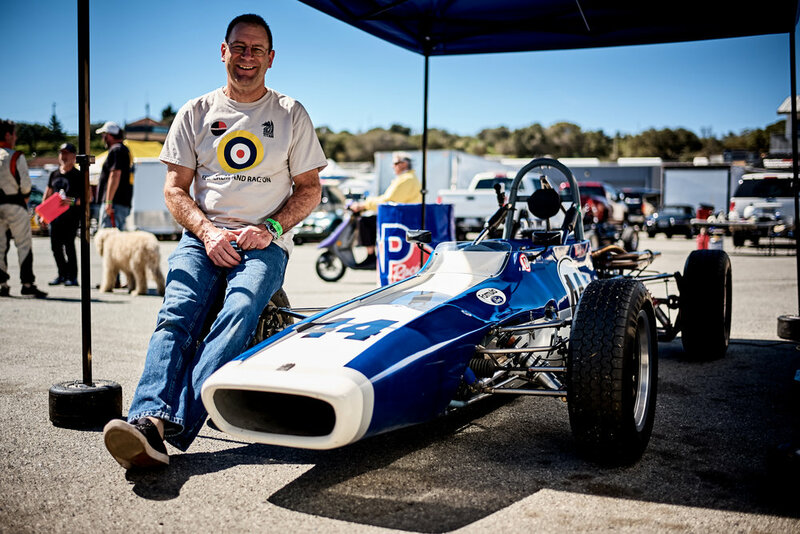 Art Hebert came in a strong P2 in Historic Ford, followed by Danny Baker in his constantly improving Lotus 61. Second in Club Ford was Tom Duncan, part of a very tight pack with hard charger Ed Lauber, Laurent Parmantier and Bob Lesnett. A nice recovery drive by Dave Zurlinden saw him come in just ahead of a brake-less Todd Strong, and another tight pack led my Michael Edick in his Lotus, Dan Wise and another big improver, Dwight Matheson. The highs that racing produces sometimes have corresponding lows. And we were very sorry to see Matt Ammer withdraw with suspension failure, and Becky Creighton tapped the wall on the exit of 11. In his usual style Matt loaded up and is planning on getting his and Becky’s Grand Tour back on schedule as soon as he can. Our series engineer Michael Edick took a look at the failure and shared some sound advice on both how to repair but also strengthen the part that failed. Paul Kitchen’s sparkling new body got caught by a berm and damaged and Greg Edenholm had the engine seize in his immaculate Elden PH10. They will all be back as soon as they can, but all have bottles of Twisting Turns Cabernet to help them ease the frustration. Other than Group 2 start melee caused by yours truly, there are two areas for everyone to think about. You get one move, and one move only down a straight. Anything more is considered blocking and at best its not the in the spirit of what we do, at worst, its dangerous. If someone is legitimately faster than you, hold your line, give them room they will get by. If you are faster, you will stay ahead. A defensive line is fine, but excessive defensive driving and “door closing” is no fun and has and will cause a problem if taken to an extreme. Yellow flags. Two cars passed under a waving yellow at the turn 11 incident. Both drivers have been spoken with, and its clear were a bit too focused on the car in front. We are all friends and care for each other, under positive and trying circumstances is key to this program… a yellow flag is fundamental to that care. Alvin Lumanlan will be shooting portraits of you and your car all season long. He is an incredible family and personal narrative photographer, you can see his work here . The first batch of year book photos are available now from Alvin. You can download them for free here the password to download the digital files is EveryDayIsYourBirthday feel free to share them, print them, enjoy them, but please credit Alvin when you post them online. If you don’t see yourself, we will get to you at subsequent events, so please find him, get your portrait done. The David Love Memorial registration is open, there are already 46 cars, so we will be splitting up into two groups again. If you have any questions or need anything in advance of the next event, please let us know.